Bocas del Toro offers a great range of abundant aquatic life bordering all islands. Being part of the La Amistad area, Bocas del Toro is recognized worldwide for its biological diversity. The region protects the largest zone of undisturbed highland watersheds and forests in southern Central America. Due to calm conditions and highly competitive pricing, Bocas is amongst the most ideal places to participate in scuba education! Whether discovering the underwater world for the first time, advancing your existing certification, or simply needing a refresher, La Buga Instructors are prepared to accommodate your needs. Being consistently warm, calm and marine-rich, the water forms brilliant premises for relaxing diving experiences. Regional visibility peaks during the dry seasons (Feb – Apr & Sept - Oct) however, our gentle rainy season ensures above average conditions all year long. With its endless reefs, the archipelago of Bocas del Toro offer divers a lot of variety. Many dive spots are accessible easily in half day trips, but there are also remote, beautiful dive sites to be explored in full day tours, however this is seasonal (mostly Sep-Oct). 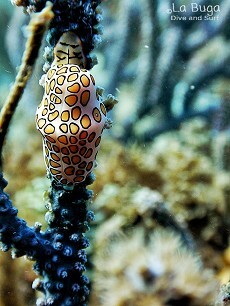 Hover along blankets of colorful soft coral and sponges and gaze upon marvelous macro life in its greatest variety. Find cowries, blennies, flying gurnards, scorpion fish, arrow crabs, decorator crabs, nudies, mantis shrimps, peaderson cleaner shrimps and many more in their natural environment. 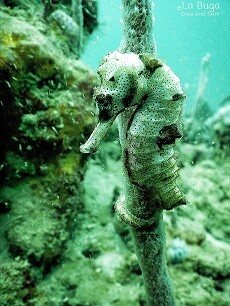 Behold tiny sea horses hiding in the sponges or spot a toadfish under the corals. Be amazed by tunicates of all colors and shapes and be ready to discover a whole new underwater world. On top of that you when lucky you might be able to observe larger ocean dwellers during your dive, such as nurse sharks, spotted eagle rays, southern - and whiptail stingrays and devil rays. There are larger schools of jacks and snappers, big groupers and burr fish. Make your reservation now by paying a deposit through PayPal to make sure you have a spot! 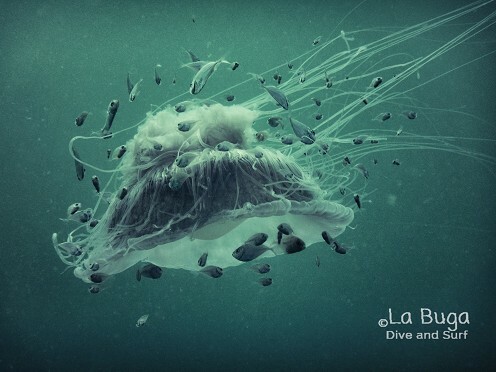 For more information check our dive courses, dive sites and special dive trips.